I may need to obtain an International Driving Permit. (Not for Ireland). My car number plates will need to be changed as they depict the EU Flag. They will need to show GB. I will need to continue to carry my V5 registration document. If there is no deal I will need to obtain a green card from my car insurer. If there is no deal and I have an accident in EU there are more complicated legal processes in the procedures needed to resolve insurance claims after Brexit. The EHIC European Health Card is unlikely to be valid if we Brexit without a deal. I’ll need to check my annual travel insurance and annual car hire insurance is still valid before I travel after March 29th. I believe drivers from EU Countries will also need to check where they stand if driving in the UK after 29 March also. My next trip to EU where I will be driving takes place before 29 March so I don’t need to do anything about that. I’ve decided to hold off until everything is decided, deal or no deal, before I do anything. How long is the proverbial piece of string? Half as long as two pieces of string. Twice the length from the centre to either end. The one I have was 10 feet long when manufactured, but It is a little longer now, The paper binding came loose and I had to rewind the loose end. same from this side. Apparently some 450,000 green cards are being printed for our insurers to issue. I’ll be over in Wales for my usual May Bank Hoiliday mountain biking trip and no doubt up in the Mournes before that so we’ll await developments. If you are coming across to EI feel free to give me a buzz if you want some company on the Wicklow Hills or some local beta. Thanks for the offer Declan - I’d like to come back over and do a few more in EI. Also would like to finish off the Mournes when I get chance and do soem of the easy Antrim summits. Its costly crossing the Irish Sea with a car - much cheaper to get to EU using Le Shuttle, snag is I have to drive 280 miles to get to the port in Kent. Having said that, Stranraer is over 230 miles. Last time I came over in 2016 I got an Easy Jet flight from Liverpool but I only had a few days to spare so didn’t get as much done as I would have liked. I believe drivers from EU Countries will also need to check where they stand if driving in the UK after 29 March also. We are actually thinking of spending some time (also activating) in Wales in May but if things get too complicated we’ll have to reconsider…. .
We have already planned for August Cornwall. Flights, holiday apartments and rental cars are booked. The international driver’s license and a new passport have been applied for. The CEPT license should still apply. Great stuff Armin - enjoy Hensbarrow Down and the other, much nicer Cornish summits! Yes, RSGB sources state quite clearly that whatever happens with Brexit CEPT remains as it is now. So not too many changes ! like to roll to the right and pay differently, in €uros not in English coins … yes, if I forgot the customs … I thought to see the simulations to cross under the Channel… it’s not won and I thinking the other ways, ferry and shuttle will also be impacted ! same from this side. Apparently some 450,000 green cards are being printed for our insurers to issue. I am puzzled that Irish insurers are going to issue green cards? Are these for use when driving in the UK only? Because nothing will change in respect of driving in other EU countries with an Irish Driving Licence. I am now wondering whether I will need a green card to drive in the ROI with my UK licence and UK insurance. At present, both my licence and insurance are valid in the ROI without the need for any additional documentation. I have a EU wide car-hire excess insurance policy for me and Mrs. FMF valid to next November. 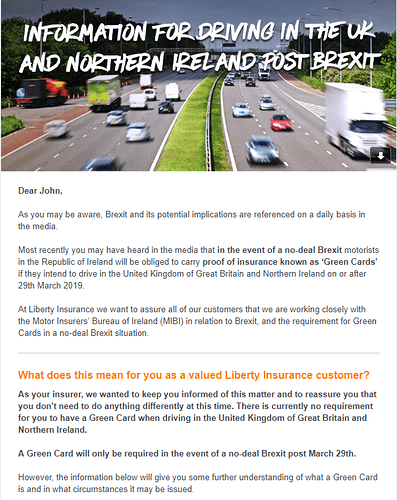 They recently emailed and said they were not sure what was happening and they may have to cancel the policy and refund pro-rata after Brexit. Or maybe not. They were letting me know I may end up with a refund and no excess cover and to check the policy was valid for each hire outside the UK. The answer is who knows at present. 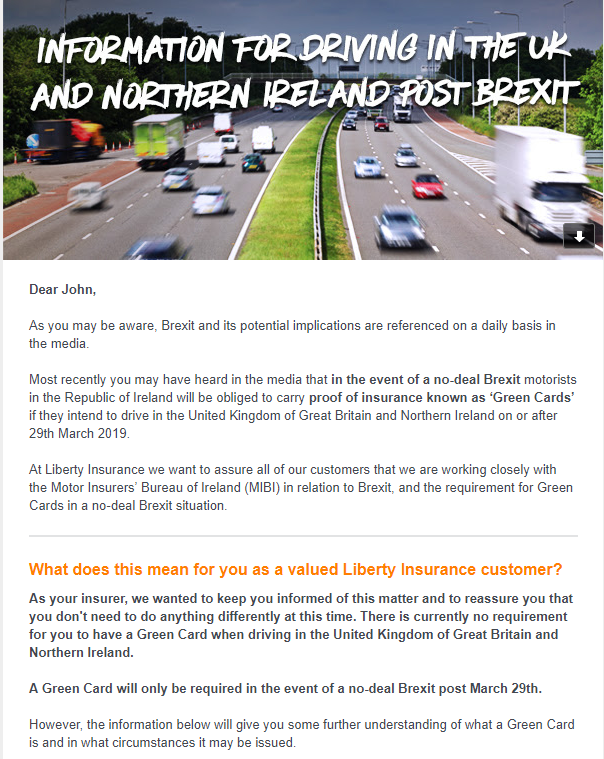 I received this unsolicited email from my insurer regarding Green Cards/Brexit. I’m guessing that UK/NI drivers will need the same when driving in the EU in the event of no-deal. Says I’ll have to order it 4 weeks in advance (and no doubt incur a hefty charge for the privilege). My car insurance here in Germany comes with a Green card as standard and has done since I arrived back here five years ago. 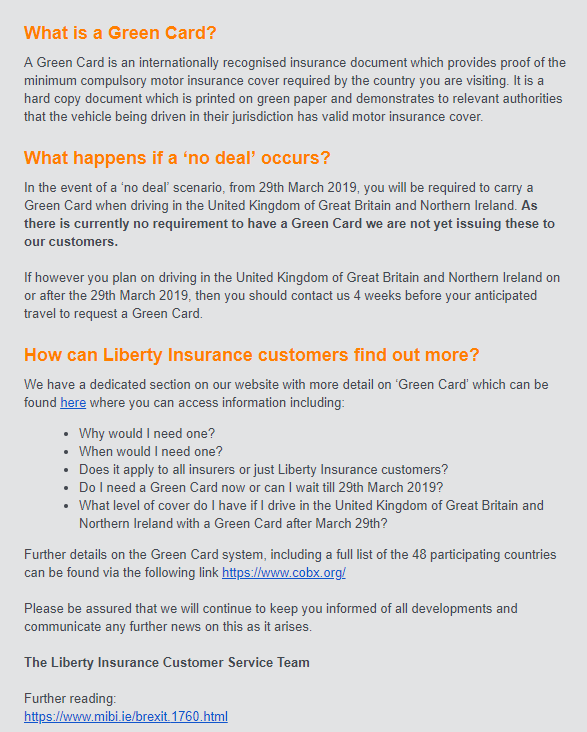 So if other insurers in Germany do the same, I guess anyone travelling from Germany to the UK after Brexit will already have the Green card (it’s actually a sheet of A4 green paper). Now IDP’s might be another issue I don’t ever remember needing one when I lived in Germany and travelled regularaly to the UK 30 years ago, but as my German driving licence then was based on my UK licence, that could have been the reason. I guess we’ll know more sometime in in May (not April) by the speed ALL governments work! Just in time for those coming from the UK to Ham Radio in Friedrichshafen in June. As an insurance broker myself I can tell you that at present no one knows what the outcome of Brexit will be. This is having particular ramifications for hauliers. BIBA (the British Insurance Brokers Association) have told us that the UK and all 27 EU countries wanted to sign up for a reciprocal agreement when this fiasco started; however the EU Commission blocked it. I would hope that in the event of no deal an agreement can still be reached. Thank you very much for this very informative posting. I had hoped that UK/ROI drivers would be exempt from all this bureaucracy! We shall have to wait and see what happens. I still live in hope that a “no deal Brexit” will not happen … but who knows! P.S. I have just contacted my own Insurer (Liverpool Victoria) and they don’t know at the moment whether a Green Card will be necessary. After the announcement by the UK Prime Minister on Tuesday making the liklehood of Brexit being delayed after March 29th or being stopped altogether, the pound rallied against the €uro and is now trading at around €1.145 to the £. It may therefore be a good time to buy in some €uros for UK operators planning SOTA holidays in EU this year. I put my order in late last night for some €uros after finding that an online order to the Post Office offered the best rate. Collection available from the local post office after 11.00am today. Thomas Cook and another local travel agents rates were slightly inferior to the Post Office. Just received an email from the richer Eurotunnel Le Shuttle offering free Brexit free cancellation reassurance for bookings made before 22nd March for travel to France between 14th March and 30th September 2019. Maybe the out of court settlement of £33 million Eurtunnel received from the UK Government for not considering them for a contract is helping to fund this. This is a very good solution for any activator considering a EU SOTA Tour this summer and are undecided because of Brexit. Brexit is not stopping me I can tell you! I have no connection with Eurotunnel - other seaborne services are available from various ports, but not from Ramsgate. Also worth checking into for anyone who is planning to drive down to Ham Radio in Friedrichshafen, in June.